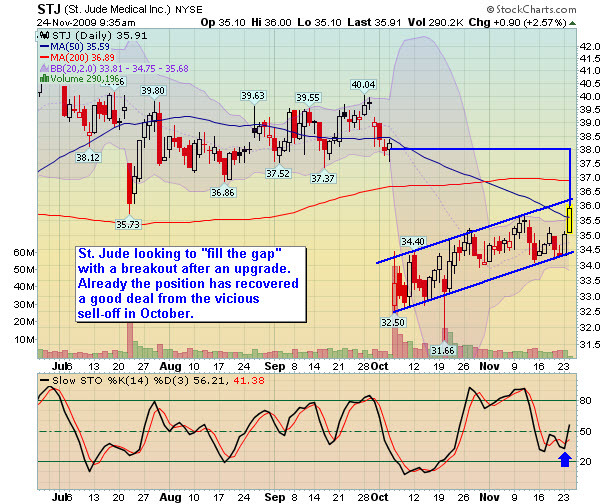 St. Jude Medical (STJ) took a nasty beating last month as their earnings outlook and several analyst downgrades. Today we are seeing the first upgrade – all the way to a buy. This is creating a short-squeeze as it passes above resistance and creates a fill-the-gap scenario. Even so, we picked up shares in October, after the sell-off, and added to the position today as the the price broke above resistance. Technically this stock is poised to move higher and the fundamentals are showing a positive outlook. Morgan analyst says, “We are initiating coverage with a Buy rating and a $42 price target, which is 16x our 2010 EPS estimate of $2.68, at the upper end of the current comp group range of 13x-16x. St. Jude is a high-quality name in the group and deserves a premium valuation, in our opinion, because we believe it has better than average long-term growth prospects.